i blog follow...and am most excited about the sticker! geez, how do I not follow you on facebook. NOW I DO! I follow you here and on twitter too! ooo la la I hope I win! I follow of course! I linked your giveaway in my blog! check it out, i twitterededed! Linked your giveaway on my blog, under imaginary giveaways. I love, love, love Lemon Lime Gu Brew! follower! and...now I gotta do the rest later cuz im at work. haha! excited for a giveawayyyyy though!! I follow your blog and on facebook! 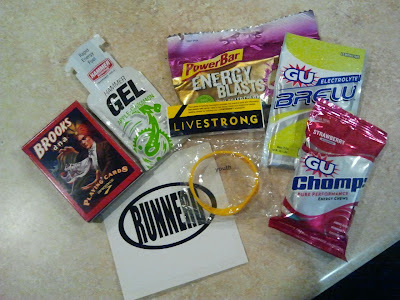 I still need to put my Runnerd sticker on my car..
And I like you on FB. Because I'm cool. And you are cool. I follow you on Twitter AND facebook! woot!